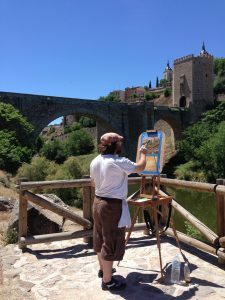 Study in Spain with UA Art and Art History in May 2019! Contact Jason Guynes for more information or to add your name to our list for 2019’s trip to Spain. 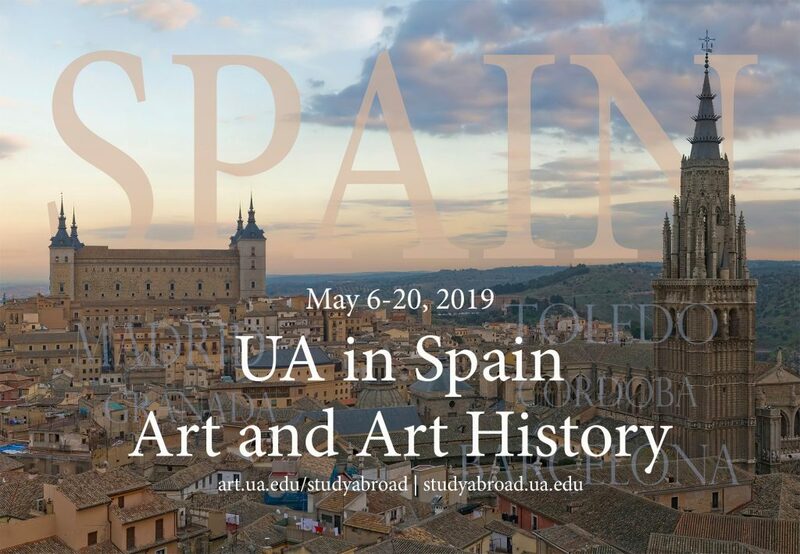 The Department of Art and Art History at the University of Alabama is hosting a study abroad experience in Spain scheduled for May 6 through May 20, 2019. The program begins in Madrid and ends in Barcelona. It will be based in the medieval city of Toledo, a world heritage site, with excursions to Madrid to visit the Prado, Reina Sophia, Palacio Real, and Thyssen-Bornemisza Museums, an excursion to El Escorial to tour the palace, monastery and museum, and to Segovia to tour the Alcazar and cathedral. The program includes a two-day excursion to the cities of Granada and Cordoba visiting the Alhambra and the Mesquita. Activities conclude in Barcelona with tours of the Sagrada Familia and Casa Mila. The program will be guided and courses taught by UA professors Dr. Tanja Jones and Jason Guynes. Up to six credit hours may be earned in studio art and/or art history courses with some work required prior to and after the trip. The price is $4900 which includes 6 credit hours, transportation in Spain, lodging, daily breakfasts, admissions to all museums and sites, guides, and a welcome and departure dinner. Participants will reside in centrally located, 3 star hotels throughout the program. Accommodations are based on shared occupancy of 2-4 persons per room (separate beds). Single accommodations are available for an additional charge. Also included are daily breakfasts and welcome and departure dinners. Students may register for two classes with up to six (6) credit hours awarded. Typically, students will register for one studio course and one art history course. Registration for classes will be handled on an individual basis in an effort to best meet the educational needs of the student. Studio courses include: any level of drawing or painting, or directed studies in studio art. ART 208/408 Special Projects: Study Abroad Studio will be offered in the areas of Drawing and Painting. Art history courses offered are ARH 363 Masterpieces of Spanish Art and ARH 467 Topics in Renaissance and Baroque Art (W). Some course work will be required prior to and after the trip. The cost of the UA Art and Art History in Spain program will be determined and published soon. Program costs include all in-country transportation; accommodations as described above, daily breakfasts, welcome and departure dinners in Spain, specified museum and site entrance fees, and international health and emergency insurance. Students must arrange their own airfare or other travel to arrive in Spain during program dates. All meals, other than breakfasts and specified dinners, are at the participant’s own expense. Participants should budget additional funds for art supplies or personal expenses such as souvenirs or independent travel, based upon individual spending habits. Payment schedule will be published soon. Financial aid may be applied to this course. If interested in applying for financial aid, please contact a financial aid officer at your earliest convenience. This course is part of the UA summer interim schedule of courses. Space is limited to 25 participants.